Early morning light on the Ness structures – beautiful! The weather in Orkney can be variable to say the least! Nick the director swears that the only place he has ever suffered heat stroke was in Orkney – but definitely not today, with a very brisk wind whistling down from the north pole – not a typical summer’s day. However, the site is now looking absolutely amazing after its spring clean and, in the morning light, just looked perfect. Changes are already happening as teams of diggers appear in every corner of the trench, including a return to Structure Twelve. Shannah removing later deposits within Structure One, while Giles explores its secondary hearth. Here, Dave McNicol, and his team, continue to further define the robbing cut that had removed much of the east wall of the building. While in the interior, the task of removing yet more collapse and infill continues, with the promise that floor deposits may soon(?) be reached. But will Structure Twelve reveal a collapsed, stone, slate roof horizon just above these floors, just like Structure Eight, or will there be other surprises? Watch this space! The new trench extension has been cleaned and photographed and the trowelling line of diggers is once more in place to take down the soil to the next level. Expectations are high as there were already some very nice finds made yesterday in this new area – several very nice pieces of retouched flint. The quality of the flint suggests that, like much of the flint assemblage from the Ness, it is not local flint but from the east coast of England – perhaps Yorkshire or Lincolnshire. Several sherds of Grooved Ware pot have also been found, but, like many of the ceramics at the Ness, are very badly fired and often crumble before your eyes – very distressing. Removal of next layer in new extension starts to reveal more of Structure Fourteen. However, as predicted, more of Structure Fourteen is gradually being revealed, with wall lines appearing all across this extension. Most exciting are the sections of wall that aligned with that discovered last year – and, as predicted, another stone pier has started to reveal itself exactly where it was thought to be. Thus creating another side recess of very similar dimensions to that uncovered last year. This sparked a debate about the existence of the so-called “megalithic yard”. Nick, the director, however, pointed out that even in the medieval period there was no standard measurement, even in the construction of the great cathedrals, where units of measurement varied from place to place. Although there were some standards, e.g. the Roman foot, the French Royal foot and the pes manualis, each master mason would adopt or have his own standard unit that he applied to each building project. But now the sun has returned, so all is well, if a little drafty! Dave and Lynda prepare one of the hearths in Structure Eight for archaeomagnetic sampling. Structure Ten is now completely cleaned, and, as the weather is perfect for photography, it is being re-photographed, in great detail, by Sarah and Mike. As the photographic record is a very important part of the site archive, and plays such a crucial role in post-excavation analysis and reporting, one can ever have too many photographs. Meanwhile, in Structures One and Eight, hearths revealed towards the end of last season are prepared for archaeomagnetic dating samples, to be taken by Dr Cathy Batt early next week. 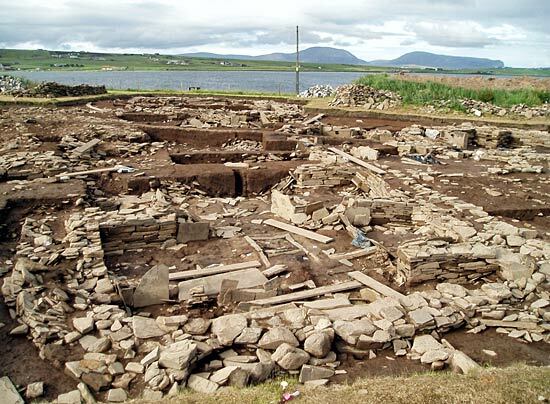 Let’s hope Cathy is successful so that we can further refine the chronology of the site and tie these, and other buildings, down to a limited period within the millennium of activity at the Ness. Sarah cleaning in the annex to Structure Ten, next to the stump of the standing stone. My name is Gillian Skuse. 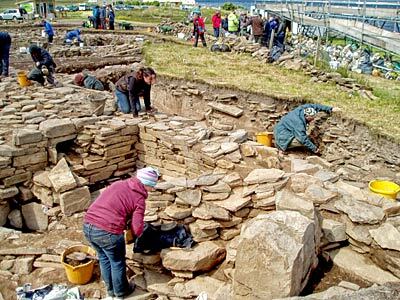 I am from Eday, one of the outer North Isles of Orkney and a third-year full-time student studying archaeology at Orkney College. The reason for me being here is that excavation is one of my core modules and it is compulsory that students attend – that is if they want to pass their degree! I am here for the first two weeks. This is my first dig, so I have no experience of what it is going to be like, what expectations the lecturers have in your excavation ability and whether I would actually enjoy it. Day one – Exhausting. Moved black polythene and sandbags to uncover the site. Day two – Exhausting. More black polythene and sandbags (if I ever see a sandbag again it will be too soon). Day three – started to dig. For the lay person that means using a trowel and scraping away layers of soil. You are told before you start how much to take off. All a bit slow and then the group I was working with started to find things. Even I managed to find a piece of pottery. Now that doesn’t sound very much, but when you think that this piece of pottery could be 5,000 years old, you start to get interested and wonder what you will find next. 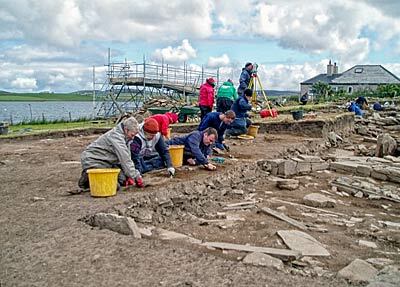 Day four – Finished off the area we started yesterday, then it was time to move on to a different area of the site. I was moved to Structure Twelve, for those of you who know the layout. This new piece of ground revealed much more in the way of finds – lots of burnt bone and my partner for this time was George, who has so much enthusiasm for archaeology it’s catching. The site is a very busy one. There is always something going on and when finds start to materialise its pretty good for everyone as we all gather round and the supervisor working with the group explains what it is and its significance. We have had lots of visitors over the last four days – in fact a tour is taking place as I write this blog and about 50 people are here. The groups so far probably average out at about that number, but with over 100 in the first tour of the year! They are made up of all ages and lots of children come round and have a look at what’s going. There are three tours during the week 11am, 1pm and 3pm. The tours last about 1 hour. The guide today is Chris Gee. He is doing a grand job, lots of happy smiley faces. There are approximately 50 people here taking part all with varying ability and experience, and from different walks of life. 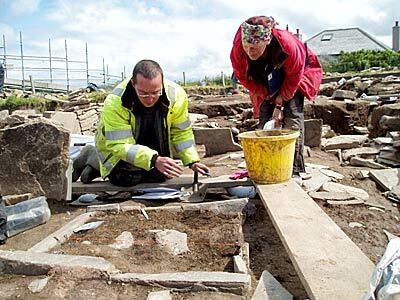 The reason for folk being here vary from someone like me who is a student to someone being interested in archaeology, maybe having no formal qualification but are keen amateurs. The age range is impressive as well, from late teens just let school to people who left school a while ago! The staff are helpful and engaging to everyone taking part, they seem to have endless patience with us all constantly asking questions. Everyone thinks when they find something a bit different it must be something important, only to find out sorry its only a stone. My two supervisors today have been Jim and Dave. I don’t really know how they stand us all taking to them at once and expecting them to know all the answers. I have met lots of nice and interesting people during this first week, some of them I have never met in person, only in the VC classes, so its been great to finally talk to them. Some of them will remain friends for a long time. Well on to day five tomorrow, the last day of the first week. Have I enjoyed it? Yes, much to my shock. Would I do it again? Maybe.